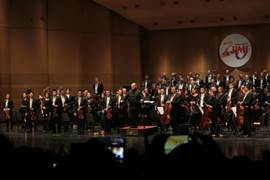 [10 November 2017, Hong Kong] The Hong Kong Philharmonic Orchestra (HK Phil) was once again invited by the Beijing Music Festival to perform this year after the widely-acclaimed closing concert in 2016. 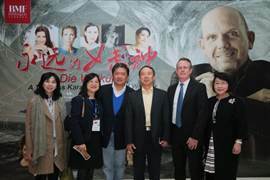 Led by its Music Director, Jaap van Zweden, HK Phil presented two programmes at the 20th Beijing Music Festival in October. The performances were an outstanding success with audiences and critics alike. 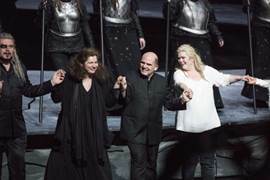 In “A Timeless Karajan Version of Wagner” (24 & 27 October), Maestro van Zweden and HK Phil restored Herbert von Karajan’s Salzburg Easter Festival staged production of Die Walküre with world-class Wagner singers and a production team from Beijing and Salzburg. There was a special significance in staging Karajan’s Salzburg version as it marked the 50th Anniversary of its premiere at the Salzburg Easter Festival. Another highlight of the Festival was Bruckner’s Eighth Symphony featured in the “Sounding Cathedral Architecture” (28 October). Maestro van Zweden had presented his very personal take on this glorious, magisterial and intensely beautiful symphony in Hong Kong prior to taking it to the Beijing Music Festival, and it was loved by the local audience. Jaap van Zweden is truly “the leading interpreter of Bruckner’s symphonies”, as BBC Music Magazine put it. 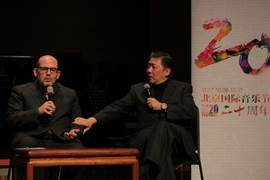 To complement the performance, the Beijing Music Festival organized a special pre-concert talk in which maestri van Zweden and Yu Long shared their thoughts on Bruckner’s Eighth Symphony with the audience. There was much meaningful dialogue between the participants and the audience. HK Phil’s Beijing tour was part of the celebration of the 20th Anniversary of the Establishment of the HKSAR. The wonderful performances were graced by the attendance of Mr. Li Jiangang, Deputy Director General of the Bureau for External Cultural Relations Ministry of Culture, PRC, and Miss Winnie So, Deputy Director of the Beijing Office of HKSAR. 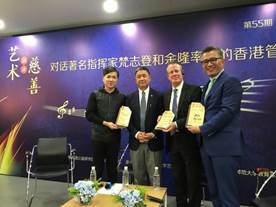 During the stay in Beijing, HK Phil’s Chief Executive Michael MacLeod and Director Mr. Steven Ying were invited to share their views on “Art and Charity” at the Jingshi Philanthropy Lecture held in the Tin Ka Ping Art Building, Beijing Normal University attended by teachers and students. The discussion was joined by Professor Xiao Xiangrong, Associate Dean, School of Arts & Communication, Beijing Normal University, and Professor Wang Zhenyao, Dean, China Global Philanthropy Institute. Jaap van Zweden, one of today’s most sought-after conductors, has been the orchestra’s Music Director since the 2012/13 concert season. Maestro van Zweden will be the next Music Director of the New York Philharmonic from the 2018/19 season. Yu Long was appointed Principal Guest Conductor with the HK Phil for a three-year period commencing with the 2015/16 season. 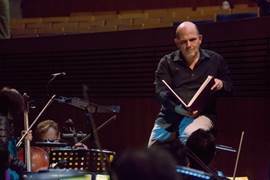 Under the dynamic leadership of Music Director Jaap van Zweden, the HK Phil has attained new heights of artistic excellence, garnering international critical acclaim. Following on from the success of the European tour, the HK Phil has toured extensively within mainland China. In celebration of the 20th anniversary of the establishment of the HKSAR, and with support of the HKETOs, the orchestra recently performed in Seoul, Osaka, Singapore, Melbourne and at the Sydney Opera House. Jaap, the HK Phil, and a superb casts of soloists, have presented concert performances and recordings of the first three operas from Richard Wagner’s epic Ring cycle. These have been enthusiastically endorsed by both audiences and critics at home and abroad. 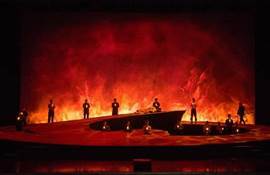 In January 2018 the HK Phil will present the final chapter of the Ring Cycle—Götterdämmerung. Thanks to a significant subsidy from the Hong Kong Government and long-term funding from Principal Patron Swire, the Hong Kong Jockey Club and other supporters, the HK Phil now boasts a full-time annual schedule of classical music concerts, pops concerts, extensive education and community programmes, and collaborations with, among others, Opera Hong Kong and the Hong Kong Arts Festival. The Swire Group has been the Principal Patron of the HK Phil since 2006. Originally called the Sino-British Orchestra, it was renamed the Hong Kong Philharmonic Orchestra in 1957 and became fully professional in 1974. The HK Phil is a registered charitable organisation.